These tracks are the exclusive property of EMF for the purpose of the 2017 MXSGP series. Tracks are not permitted for use outside of this series until the series has concluded without expressed consent by EMF. - we spent a lot of time at making different versions of the track, it is not the EMF responsability if you run a version your computer can't run properly. Special thanks to : P2sta, Jay, Checkers, DJ, SMR and off course JLV. Last edited by M@xTizZz on Wed Mar 01, 2017 7:26 pm, edited 2 times in total. Track is awesome. Such an improvement from last year. Looks like good things to come if this is anything to go by. Amazing track. Layout and visual wise. Well made! So a little more ruffness would be good and more realistic, other than that great work. Track feels very one lined and is very hard to pass as the inside line is mainly always faster, and the outside of the corners could of been made more ride-able if they weren't as flat and possibly open the racing up a lot more. Feel that it could do with more breaking bumps as it feels like am on a motorway and this is a GP track after all so there going to be giving it some gas and braking making a lot more bumps.Some of the ruts are way too rounded making it too easy to rail them. Don't know if this is just me or not but the jumps feel a bit small and a bit to mellow on the takeoffs, think they would be a bit more steeper in real life, and go pro don't do it justice as i noticed last year when i went to Matterley the wall they had was huge and was a struggle to walk up it but from the go pro i watched it didn't look no where as step as it was so that's a thing for you guys to think about. You guys have defiantly stepped up with objects looks great. I think some of the some the objects are missing shading which i think is why they look really bright, a bit to bright for a race at night. Track dirt looked a bit to dark for Qatar's dusty sandy soil. The black decal not sure if its meant to be tarmac or some sort of mat but i noticed that it is placed very roughly and i think you should of spent a little more time on that or made a circle version of the decal to make the corner not look as rough as they did. Offtrack dirt looked near enough perfect to reall life so good job with that. Loved the skybox but i think the moon was a bit oversized lol. One of the first GP tracks I've ever enjoyed playing, thanks to everyone that made it. Track looks great. Lighting, decals, signage all looks good, I think it will look really good with cams on stream! Good job on that! Play-ability - I like the fact that this track has a fun factor and should be easy enough for most to pick up and play. The track seems to be very one-lined and feels like the inside lines have only been tested. It will bring out consistency which is good, however may make for a little more boring racing as there aren't many passing places. 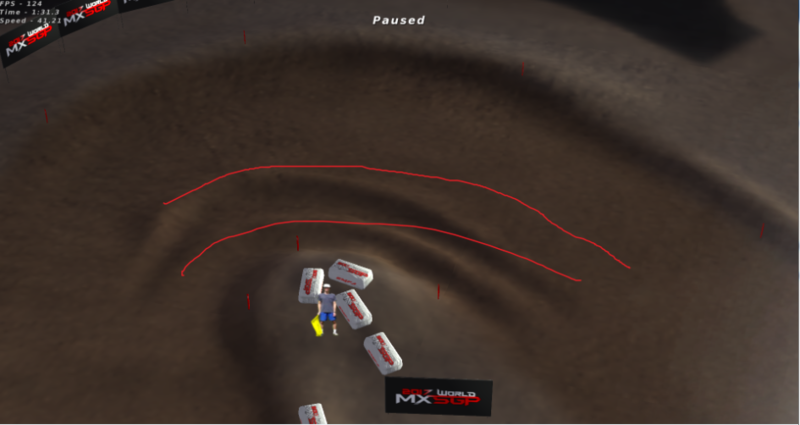 Following on from that, the ruts are just radial paint corners which have clearly been constructed as perfect semi-circles, makes it quite unrealistic and easy to see the track is just put together in the editor. As Aaron said the track is like a motorway. I like the amount of roughness in some corners, but in some it is very easy to wash the front end over everything as you're flying down a highway and coming into a small tight inside rut. You can also in every corner go from outside to inside because of the lack of roughness. 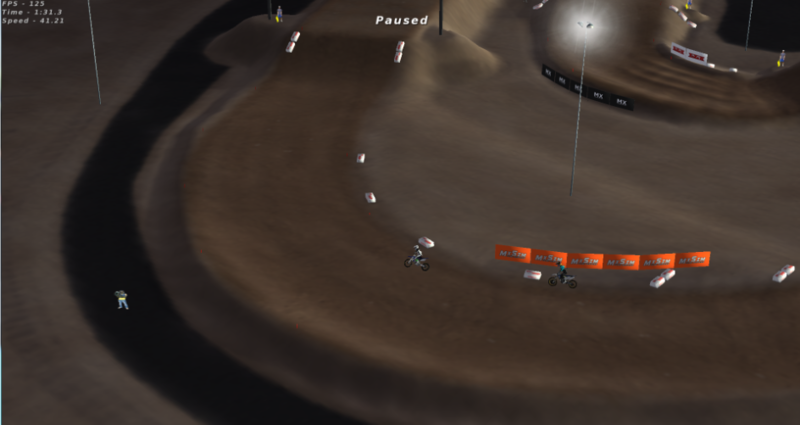 Test out each line against one-another to get a good race flowing track. Make sure insides have big ruts but big braking bumps so you have to slow a lot to get into them. Keep up the good work in terms of aesthetics of the track! Track will take me a bit of getting used to as I'm sliding out everywhere atm Might be nothing against you guys as I'm a bit rusty outdoors again! Overall I still like the track so don't take this as a moan, because it is good and I think you've done a good job. Just thought I'd share my thoughts. Thanks for you work guys! As previous posters has mentioned the track is fairly one lined and when there is multiple lines, ususally the inside line isnt rough enough to make it even with the rest so the inside is almost always the fastest. Also the roughness has been toned down and the laptimes both on Ams and Pros shows this. Its not nearly the gap between the riders as its usually are. As a replica this is pretty spot on. For any of you who watched the race this weekend could tell that the track IS extremely one-lined. It also doesnt get nearly as rough. How this should be balanced is another issue, do you make the track one-lined and hard to pass on as it was in the race or do you go away from the characteristics of the track and make it better for racing? Its a tough call. I personally like them more like replicas. It makes for different races every round. The traction is a perfect balance between grippy and slippery. The objects i good enough. Its not 100% but nothing to complain about at all. Overall its probably one of the best replicas you´ve ever made in my opinion. The fact thats its fairly easy to be consistent on will most likely provide some great racing, even though passing will be difficult and it doesnt separate guys as usual but it will at least provide close racing. Super pumped on what this year will bring! I like the track definately a major step up from last years. Only thing I can complain about is the inside ruts being really close to the little mounds on the inside and then the ruts being to close to one another in some corners. Other than that its pretty good. We did try to not be too hard on people's pc's. But good that you let us know, since some of us has high end configs and won't notice it ourselves. 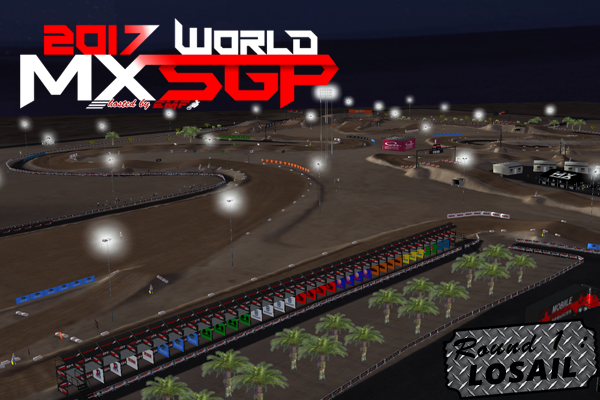 Fro77 wrote: One of the first GP tracks I've ever enjoyed playing, thanks to everyone that made it. Thanks! Super excited to hear this! Thanks for your kind words, appreciate that you let us know what you liked! My method of working is: Testing each line so it rides good; or as I envision it to ride. I'll get more into that later I think. If there are split lines like single-table top or onto tabletop-roll off it, I like to just go into playback mode and measure the time difference so it's not 5 seconds or so. Also when I make tracks, I have a really hard time to do hotlaps or go super fast, I just want to go at a cool pace riding it sort of like in real life, not in a sim fast way. That's why it might lack some stuff. However even if some lines aren't as quick as the main line, I still hope it's a viable option if you don't want to follow the rider in front of you. 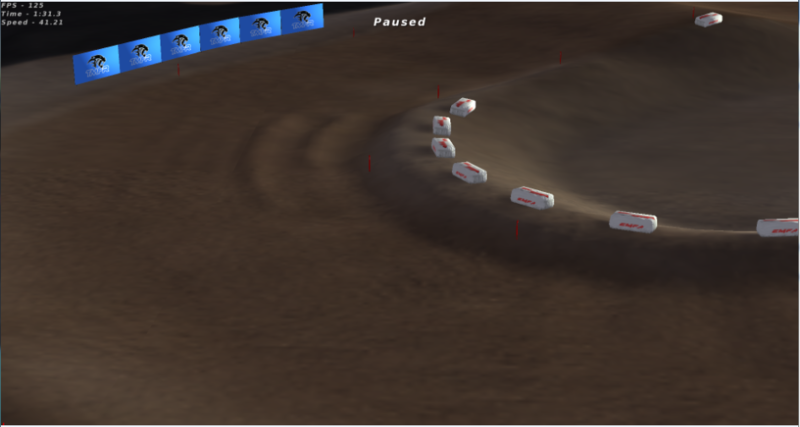 chrischanning202 wrote: Following on from that, the ruts are just radial paint corners which have clearly been constructed as perfect semi-circles, makes it quite unrealistic and easy to see the track is just put together in the editor. chrischanning202 wrote: Track will take me a bit of getting used to as I'm sliding out everywhere atm Might be nothing against you guys as I'm a bit rusty outdoors again! ryxn wrote: I like the track definately a major step up from last years. Only thing I can complain about is the inside ruts being really close to the little mounds on the inside and then the ruts being to close to one another in some corners. Other than that its pretty good. The ruts being close to the banks is one thing I consider "realistic trackmaking". A lot of tracks in real life has either bales, fences, banks or other stuff on the insides preventing you from leaning over fully. If you ask me, that's a feature that I like. That it is a rut there, but perhaps not the preferred line. Better to have a rut there, in case someone fell in the main line, simple to navigate around. Decals - Way to dark for Losail needs to be lighter... The shading this year is a improvement by far! These ruts are way to tight, you enter them and just stop dead. That was intentional. More or less all other turns has ruts or bumps in them, I wanted to keep that corner open, so people have the potential to go inside-out, outside-inside. If you're stuck behind someone, you could switch up the line and perhaps cut inside of the guy in front, that was my idea at least. They look fine for me, they're quite small so not too much to be seen. Glad that you like last years version, like it too I'll see if I can bring back some stuff from last years track in future ones. As previous posters has mentioned the track is fairly one lined and when there is multiple lines, ususally the inside line isn't rough enough to make it even with the rest so the inside is almost always the fastest. The fact thats its fairly easy to be consistent on will most likely provide some great racing, even though passing will be difficult and it doesn't separate guys as usual but it will at least provide close racing. Track feels very one lined and is very hard to pass as the inside line is mainly always faster, and the outside of the corners could of been made more ride-able if they weren't as flat and possibly open the racing up a lot more. Feel that it could do with more breaking bumps as it feels like am on a motorway and this is a GP track after all so there going to be giving it some gas and braking making a lot more bumps. Some of the ruts are way too rounded making it too easy to rail them. Don't know if this is just me or not but the jumps feel a bit small and a bit to mellow on the takeoffs, think they would be a bit more steeper in real life, and go pro don't do it justice as i noticed last year when i went to Matterley the wall they had was huge and was a struggle to walk up it but from the go pro i watched it didn't look no where as step as it was so that's a thing for you guys to think about. Track dirt looked a bit to dark for Qatar's dusty sandy soil. The black decal not sure if its meant to be tarmac or some sort of mat but i noticed that it is placed very roughly and i think you should of spent a little more time on that or made a circle version of the decal to make the corner not look as rough as they did. Offtrack dirt looked near enough perfect to real life so good job with that.